FAT, NTFS etc. are file systems hard drives use to organize files and folders on your computer. The blue screen error with code 0x00000023 indicates corruption in the FAT file system. Bad sectors on the disk can also induce this error. Improper shutdown or power loss when the system is connected to a UPS are the main causes of file system corruption. It does not happen always but occurs when the computer has not saved information that it needs to run again properly. It is purely based on timing. If you encounter a blue screen of death error, you most likely cannot access your computer. Hence, you will need an installation CD to run the repair utility. Microsoft provides a repair tool called Chkdsk to repair corruption on the hard drive. Turn on your system and insert the installation CD. You will be presented with a black screen, type chkdsk C:/f and hit Enter. This will check your disk for errors and fixes anything it finds. After completion, you will receive a status message. Then type ‘exit’. This will exit from the console and restart your computer. Remove the installation CD and you should have your computer working again. 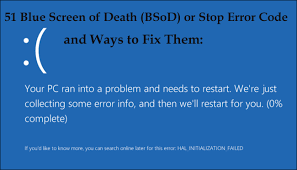 In the event of a system crash or power loss, you may encounter blue screen of death error. In worse cases, you may even lose all data and partitions. It’s great if you have a backup, you can just restore it. If not, it’s a difficult situation. But luckily, there are programs like Remo Recover which can recover all your data. The software can perform complete partition recovery with the folder structure and original data intact. It works on a read-only mode, so no damage will be caused to your original files. It can also be used to recover data from missing partitions due to virus attacks or other reasons. All file systems like FAT, NTFS etc are supported by the tool. Sometimes, partitions may get deleted when you improperly resize them (while you add or delete) or due to virus attacks. In such cases also, you can use Remo Recover. The article recover deleted partition in Windows 7 provides a complete overview of the recovery process. Further, it is possible that you have always been shutting down your computer correctly and no crash/power loss has occurred. If you still face this error, you can troubleshoot the issue by following the steps. Driver updates are automatically installed with Windows update. If you have not enabled automatically install Windows updates, it is highly recommended you do so. To update the drivers manually, follow the steps here. Try removing any recently installed software and check if the problem is resolved. To do so, select Start button > Settings > System and click on Apps & Features. Then Sort by install date. Choose recently installed applications and uninstall. Sometimes, hardware may be the issue. Disconnect any additional hardware like printers or additional monitors and check if the problem is resolved. If the issue is due to a virus attack, run reliable antivirus software. This should clear any virus or malware infection on your system and resolve the issue.